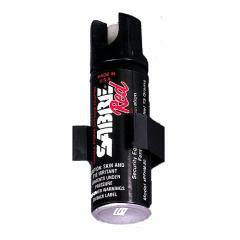 Stay home and watch a movie or answer your door with peace of mind knowing you have the proven protection of Sabre's Red Pepper Foam Home Self Defense Spray with Mount. The sprayer utilizes Sabre's purified formula that boasts a 10% oleoresin capsicum concentration with a debilitating 2,000,000 Scoville Heat Units. The powerful foam offers total facial coverage that smears and spreads when it is rubbed. Before it even makes contact with the skin, the formula begins attacking the sensitive membranes of the eyes, throat, nose and ears. This leaves would-be-attackers temporarily blinded, disoriented and incapacitated so that users can take appropriate action. The spray leaves behind a UV detectable dye for positive suspect identification and apprehension. For enhanced home safety, the canister comes with a wall mount that can be secured right by the door. Wonderful product. Arrived just as advertised and quickly. My personal preference is for the flip-top OC products. This Saber pepper foam has a button on top that need's to be rotated 45 degrees or so to turn off the safety. That's fine too. Just need to practice with it a bit. Great product.